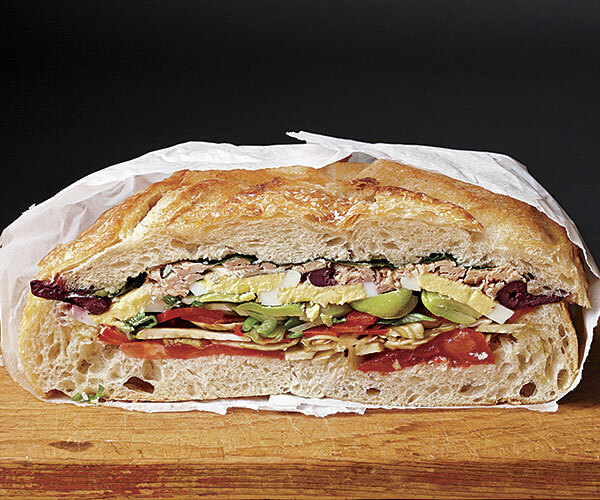 Pan bagnat, Niçoise dialect for the French pain baigné, or “bread bathed,” is basically a sandwich version of the Niçoise salad, so called because the dressing soaks into the bread. Traditionally, it was a carry-along meal for fishermen and field hands, but it’s become classic picnic fare in France. Always prepare pan bagnat a few hours in advance of eating to allow the ingredients to marinate, the bread to moisten, and the flavors to blend. In a small bowl, whisk the vinegar and mustard. Continue whisking as you add the olive oil in a slow, steady stream to emulsify. Season to taste with salt and pepper. Set aside. Slice the boule almost but not quite through the center, leaving the two halves attached on one side to help keep the filling tucked in. Pull out some of the soft interior crumb to make room for the filling. Rub the inside halves of the boule with the garlic clove. Layer the tomatoes, artichokes, favas, peppers, scallions, eggs, tuna, and olives onto the bottom of the loaf, seasoning with salt and pepper in between the layers. Drizzle with some of the vinaigrette (you won’t need it all) and cover with the top half of the loaf. Wrap the sandwich foil or waxed paper. Let sit for a few hours at room temperature to let the flavors meld, or better yet, pack it at the bottom of your picnic basket so the weight on top compresses it a bit, commingling the flavors. When ready to serve, cut into wedges.